Get a taste of Milan’s high fashion on a budget at the Fidenza Village outlet shopping center. Popular with Italians, this complex has over 100 shops featuring brands such as Versace, Armani, Dolce & Gabbana, Diesel, and Furla. Several restaurants and a children’s play area make the outlet center an easy half-day trip from Milan for the whole family. Located just 90 minutes outside Milan, Fidenza Village is designed to evoke a Giuseppe Verdi opera set. Popular shops for women include Jimmy Choo, Elisabetta Franchi, and Le Silla. Among the highlights for men are Fratelli Rossetti, Aspesi, and Boggi Milano. Italian brands are well represented. Fidenza Village is a popular day-trip destination from Milan. Shoppers can visit independently or join a full-day guided shopping tour. Packages that combine shopping with golf or a visit to the Ferrari Museum, the museum of Milan’s soccer team, or the Masone Labyrinth are also available. Fidenza Village is a must-visit for fashionistas and visitors who want to score bargains on quality Italian goods. The shopping center offers free Wi-Fi, as well as an app with maps and shop details. Non-EU residents can benefit from the VAT tax exclusion within 90 days of purchase. The outlet center has a play area as well as restaurants and cafés. Hands-free shopping service is available for a fee. To reach Fidenza Village from Milan by car, take the A1 Autostrada to Fidenza–Salsomaggiore Terme. A luxury daily coach service runs between Milan city center and the shopping center, and shuttle service is available from Fidenza train station. 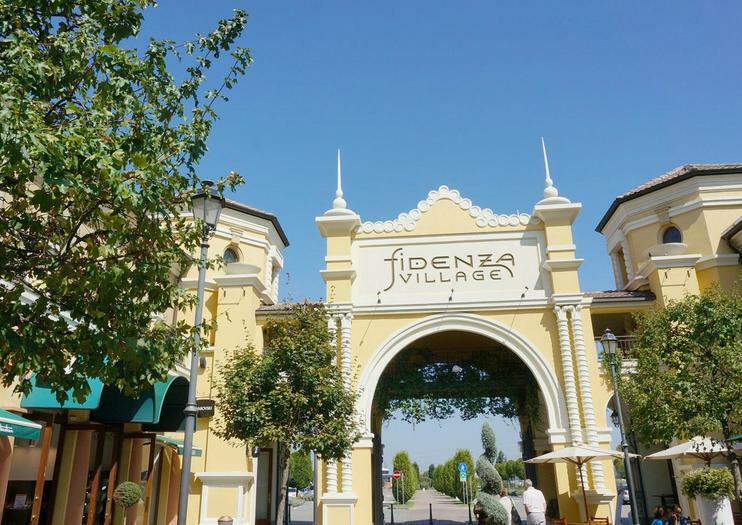 Fidenza Village is open daily. The best time to visit the shopping center is during Italy’s summer and winter sale seasons—July to August and January to February, respectively—when shoppers can get deep discounts on top of the already low prices offered here. The summer sale season is also the outlet center’s busiest time, so shop first thing in the morning or later in the evening on a weekday to avoid the crowds. Fidenza Village has some of the biggest brands in the fashion world with prices reduced up to 70%. Dozens of shops cater to every need, from fashion for men, women, and children to lingerie, shoes, accessories, jewelry, and beauty. The outlet center offers more than just shopping. In addition to restaurants and a children’s playground, visitors will find a tourist information center and currency exchange on-site. Explore Fidenza Village at your own pace on a day trip from Milan, browsing the outdoor shopping center’s 100 boutique shops to find great deals on clothes, jewelry, shoes, and more. Select either ‘express’ for transport to and from Fidenza Village, or upgrade to ‘experience’ to get a 50-euro (roughly 68 US dollars) gift card to use at the mall, a VIP card for additional savings at select shops, and a 2-course lunch. Shop ’til you drop on a full-day excursion to Fidenza. Travel by air-conditioned coach to Fidenza Village, home to more than 120 luxury Italian and designer boutiques offering discounts of up to 70 percent year-round. Take advantage of the VIP lounge and prepare to score fantastic deals.